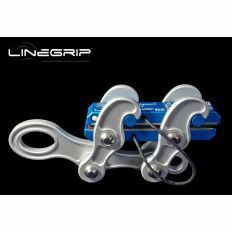 Paire of Frogs The Frog is the first webbing anchor in high-strength stainless steel, very lightweight withless than 284 g for a MBS of 60 kN, compatible with all connectors from 8 mm to 20 mm and even with slings. And the shape of the main diverter allows you to use your webbing to 98% of its strength. Of course made in France. The DIABLO 2 with new weaving and new color, it is the webbing which is going to torment you, with its 96 g/m the difficulty will be supreme. In case it would not be sufficient we can always double it and find itself with 192g / m.The webbing is weaved from fiber tinged in the mass so that over time it remains devilish. 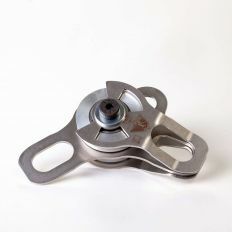 The Frog is the first webbing anchor in high-strength stainless steel, very lightweight withless than 284 g for a MBS of 60 kN, compatible with all connectors from 8 mm to 20 mm and even with slings. And the shape of the main diverter allows you to use your webbing to 98% of its strength. Of course made in France. 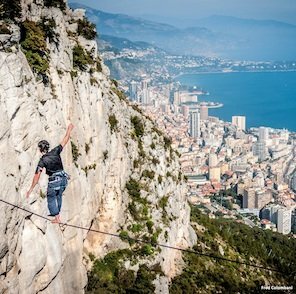 The GOKU 2 Hybrid 2.5 cm Slack Mountain, high performance composed of high-tech fiber webbing, light and very strong to do all your lengths and beat your records. 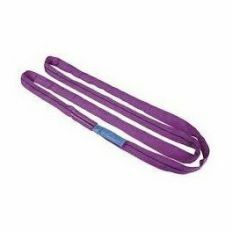 With 41g/m you can take it everywhere and will also practice on your short lengths as a travel your webbing. Technology: Edge polyester, diagonal weaving. Made in France. Want to put yourself into orbit, the Apollo kit is made for you. 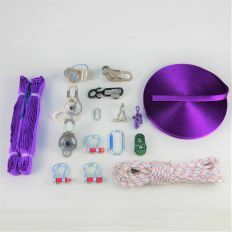 With 30 m Wallaby, Storm, Popart or Rubalise webbing and Triceratops pulley system and Ginkgo mini tension will not be your limit and safety will be ensured. The kit used by our pro trickliners. The Slack Mountain products are manufactured entirely in France. 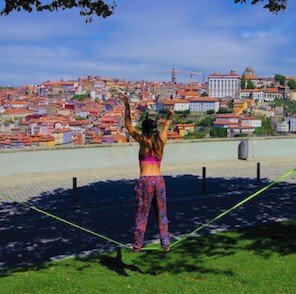 The first slackline kit for the occasional practice with a weight gain compared to kits with ratchet, 1.7kg with its carry bag so you can take it anywhere, and the 2,5 cm webbing will make you discover the first sensations similar to the longer slacklines. 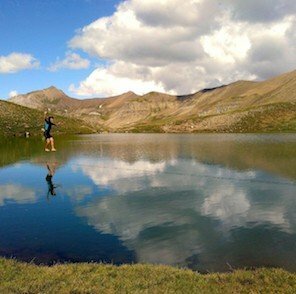 You already know that you want to make progess in slackline but you are still novice, but you have no utility of an intermediate kit, the kit Inuit 30 m will allow you to have a light primitive set-up. With its carry bag and its 2,9 kg you can take it anywhere. Available webbings are 2,5 cm wide Cobalt or Snake. The ultralight Kit Goku will be ideal during your travels with a weight of less than 895 g for 15 m. Available in length of 15, 20, 30, 40 and 50 m it will be completefor all travels where the weight is the priority. With Goku you will have a kit with a reduced elasticity and thus very easy to tension. 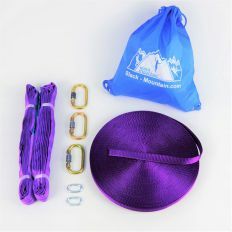 The ultralight Kit Plum will be ideal during your travels with a weight of less than 895 g for 15 m. Available in length of 15, 20, 30 and 40 m it will be complete for all travels where the weight is a priority. With Plum you will have a kit with an elastic webbing and of an incomparable sweetness. One of the webbing most light of the market with 25g / m it will be completed to be taken in kits light. 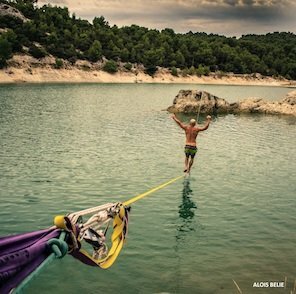 Ideal during the travels.FORBIDDEN IN HIGHLINE, FINE BELT WILL NOT SUPPORT A LEASH, FORBIDDEN IN BACKUP RESERVES ONLY FOR THE CLASSIC SLACKLINE. Set of 2 2mm calluses for Rhino Minion or Frog, Made in France in our offices in 3D printing. Made for webbing use from 20 to 22 mm. Our Wallaby trickline, is the bounciest yet. A high breaking strength.The low initial elasticity is then met by the dynamic reserve and is ideally rigged with pulleys, but can just as easily be setup on ratchets. The extra thickness compared to most lines is from the increased resistance allowing you to get more height to help stick new tricks. The webbing which will challenge you! Webbing of 25 mm with 6.5 % of elasticity under 10 kN.More elastic than one cobalt the sensations in bounce will be more lively, plaiting Squeeze, resistance in the greater abrasion. That the strength is with you!